I remember that when I was a child, my parents always told me to avoid eating too much chocolates and drinking hot and cold water at the same time. They always remind me of having a healthy teeth. As I grow old it puzzled me on why do my parents always warn me this things. And as I become older, I do become conscious on how I look in front of others. I believe that having a really white teeth is really needed especially when I see commercials in television having models with really nice and white teeth. Who doesn’t want to have a whiter teeth? In general, we all want to have a whiter teeth that is why some goes to dentist for whitening through abrasion. But did you know that the treatment of teeth does not end at the dentist treatment? Your teeth needs to have special care and attention. 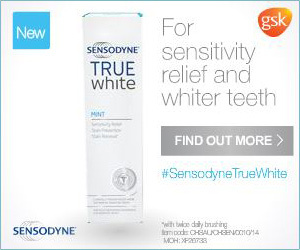 Sensodyne True White provides relief from sensitivity with twice daily brushing and is also more than 10 times less abrasive than many everyday whitening toothpastes. I just learn that it is really important that we take care our teeth and finding toothpaste which is less abrasive will help protect the sensitive teeth. The next time you buy your toothpaste check and research its abrasive ingredients that maybe too harsh if you have sensitive teeth.